Isaac Brown is the writer and artist of Geek Speak Comics. The first ever Geek Speak comic strip originally appeared in 2010 on Isaac’s blog, The Adventures of Normal Guy, where it can still be found. 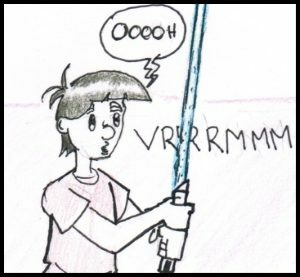 Since then Isaac has been writing and drawing comic strips featuring a cast of recurring characters, as well as one-off jokes, and strips based on his family life. Influences on Isaac’s work include the great 80’s comic Bloom County, the timeless and wonderful Calvin and Hobbes, the great webcomic Sequential Art by Philip M. Jackson, the hugo-award winning steampunk comic Girl Genius by Phil and Kaja Foglio, and Penny Arcade by Jerry Holkins and Mike Krahulik. Isaac lives in California with his family.